At a distance of 233 km from Delhi, on the banks of the Yamuna, is the historical city of Agra, which is home to the world famous monument of Taj Mahal apart from numerous other structures, which have stood the test of time and transport you to a bygone era. The city is the abode of three UNESCO World Heritage Sites namely the Taj Mahal, Agra Fort and Fatehpur Sikri. 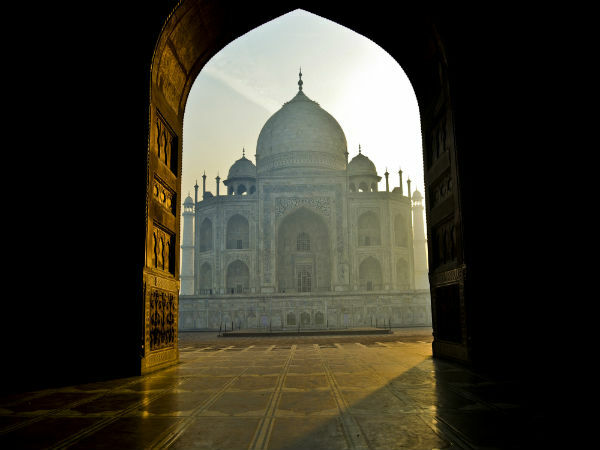 Agra is known for its Mughal monuments which attract visitors from near and far alike. The city was the capital of the Mughal Empire and was ruled by Akbar, Jahangir and Shah Jahan and eventually fell into the hands of the British in the year 1803, who later established the Presidency of Agra in the year 1853. During the Mughal rule, the place was called Akbarabad and is said to have been founded by Sikandar Lodi of the Delhi Sultanate in the year 1504. It fell into the hands of the Mughal Empire in 1524 after the first battle of Panipat. Best Time To Visit: Agra is a year-round destination; however, the months from October to March are considered as the best time to visit the place due to the pleasant climatic conditions. By Air: Although Agra has its own airport which operates domestic flights. The nearest major airport is the Indira Gandhi International Airport which is located at a distance of 221 km from here. The airport is well connected to major cities across the country and to a number of cities abroad as well. By Train: Agra has four railway stations, out of which Agra Fort and Agra Cantt are most popular ones. Both the stations are well connected to major towns and cities across the state and to a number of cities across the country. By Road: One of the best ways to reach the place is by road as it has excellent connectivity by road transport. There are regular buses which operate from Delhi, Lucknow, Chandigarh, etc. to Agra and vice versa. The total driving distance from Delhi to Agra is roughly about 233 km which would take you about 3 to 4 h to reach Agra. There are three major routes from Delhi to Agra which are as follows. If you are opting for Route 1, it would take about 3 to 4 h to reach Agra via the Yamuna Expressway due to which the travel time is cut short to almost 3 h. If you are opting for Route 2, it would take you about 5 h to reach the place via the Yamuna Expressway and NH 44. If your choice is Route 3, then it would take you 5.5 h to reach the place via NH 509. Since Route 1 passes through the Yamuna Expressway, there is not much to see around apart from the various industries which comprise of automobiles to chemicals. However, one can stop over in between the expressway for a short tea break and continue further to Agra. Agra is part of the Golden Triangle tourist circuit connecting Delhi and Jaipur. Since the place was one of the most important cities in India under the Mughals, it witnessed quite a lot of developmental activities which comprised of forts, mosques, gardens and much more. The Mughals were indeed very keen architects which can been proved by Taj Mahal, Agra Fort and many more such wonderful structures. Completed in the year 1653, the Taj Mahal was built under the patronage of Shah Jahan as a tomb for his most loved wife, Mumtaz Mahal. Constructed in marble, it is believed to be one of India's most beautiful monuments built alongside gorgeous landscaped gardens. Built by a Persian architect Ustad Isa, this magnificent structure is located on the banks of the Yamuna river. One can find verses of the Quran inscribed on it. At the top of the gate are 22 small domes, which signify the number of years it took to build the monument. Built on a marble platform which stands above a sandstone one. The interiors are decorated with fine inlay work and incorporates semi-precious stones. The monument has been declared as a UNESCO World Heritage Site and is one of the wonders of the world. Commissioned by Akbar the Great in the year 1565, the red sandstone structure was used as a palace for Shah Jahan who renovated it with marble along with an inlay of floral designs. The fort also has been declared a UNESCO World Heritage Site. The structure is one of the best examples of the Mughal architecture. Located 35 km away from Agra, Akbar built this city and shifted his capital to this place. The site has been recognised as a World Heritage Site by UNESCO. Akbar built a majestic fort here but had to move it back to Agra due to shortage of water. Built in the year 1528 by Babar, Ram Bagh is the oldest Mughal garden in India which is located on the banks of Yamuna. The pavilions here are designed in such a manner that the breeze from Yamuna along with the greenery of the place would keep the place cool even at peak summer. The garden was originally named Aram Bagh or the Garden of Relaxation and was used by Babar to spend his leisure time.